robin hood: Robin Hood (1906) the stage play. 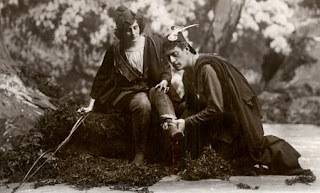 The legend of Robin Hood had of course been the basis of many stage plays well before 1906. As far back as the Tudor period in England, when the growth of theatres positively thrived, "morality plays" were enthusiastically received by the largely uneducated public, and what better theme than Robin Hood? In fact so popular was Robin as a subject that the governments of the day grew rather concerned. All well and good to deliver plays called "Jealousy" or "Greed", but what kind of message might be gleaned from an outlaw who robbed from the rich? There is a quote from one Bishop Latimer (dated 1549), that tells of him travelling to London and stopping along the way, only to find the church door locked. When enquiring as to why, he was told "Sir, this is a busy day, it is Robin Hood's day". The Bishop recorded his concern: "Robin Hood, a traitor and a thief. It is a weeping matter when people prefer Robin Hood to God's word." At the start of the 20th Century, and before cinema largely replaced the theatre, Lewis Waller was the most famous actor to portray Robin Hood prior to Douglas Fairbanks. Born in Spain in 1860, he formed his own company in Haymarket c.1895, producing and performing the lead role in "Henry V". Similar appearances ensured his reputation grew fast. In 1906, at the Lyric Theatre, London, he took the lead role in "Robin Hood". This was William Devereux's first play, written in collaboration with Henry Hamilton, and it ran to 163 performances, plus matinees. A further measure of its success was the number of promo postcards it elicited. Little is known of the plot line. Certainly the emphasis would seem to have been on romance, with Robin Hood / Earl of Huntingdon (Lewis Waller), using a servant girl Adela (Dorothy Minto), to deliver his amorous messages to Maid Marian / Lady Marian de Vaux, Evelyn Millard. Playwright William Devereux played King John, and a postcard of Ethelbert Edwards, known for his height, suggests Little John was also present. Many of these names would go on to have very successful careers in the emerging silent movie industry. Above L-R: Lewis Waller as Robin Hood, Evelyn Millard as Maid Marian, Ethelbert Edwards as Little John. For more pictures from this production see THIS LINK.